Surging oil and gas prices have boosted profits at ExxonMobil, the world's biggest oil company. Profits in the fourth quarter soared 50% to $4.09bn (£2.5bn), beating analyst expectations. Fears of a potential war in Iraq and a labour strike in Venezuela, which crippled its oil exports, have pushed oil prices up by 40% over the year. Exxon's exploration and production division was lifted by the oil rally, but it took a toll on the refining and marketing and chemicals businesses, where crude oil is used as a key raw material. Sales jumped 18% in the fourth quarter to $56.2bn, even though revenues for the year 2002 dipped 4% to $204.5bn. Although full year profits fell by a third to $11.5bn, Exxon-chairman Lee Raymond said profits in the last period were the highest since the second quarter of 2001. Tyler Dann, an analyst at Banc of America Securities said: "It was pretty clearly a strong quarter, though I don't think it is indicative of a company firing on all cylinders." But investors seemed pleased with the news. On the New York Stock Exchange, shares in the world's largest publicly traded oil company gained 1% to $34.20 on the news. Shares had already risen 10% in the fourth quarter. Exxon's news followed good results from ConocoPhillips, America's third-largest integrated oil company, which also posted better-than-expected earnings due to strong oil prices. America's second-largest publicly traded oil company, ChevronTexaco, will report on Friday. 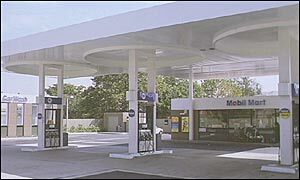 ExxonMobil's brands include the petrol station chain, Esso, the convenience store group, On the Run, and Mobil oil products.